With eight boys, I've done a lot of laundry. That is one thing that I didn't make them do, unless they were going away to school. The boys are good about grabbing the laundry buckets and carrying them for me, when I'm carting them back and forth. Running loads during the night, early morning and late evening (our electricity is more expensive during peak afternoon hours.) I do five loads a day, consistently for a long time. When I no longer had diapers to wash, it seemed I still had wet-bedding to do. When that wasn't an issue, the boys had grown and their clothes were bigger and took up more of a load. I put one outside the bathroom where most of the showers take place (in my room). The boys put colors and darks there. We have a separate pile for whites that don’t need a bucket. My husband puts his clothes in a completely separate pile. The other two buckets may either have clean clothes waiting to be folded (within a day of washing) or a bucket in the laundry room, waiting for the clothes to be finished. 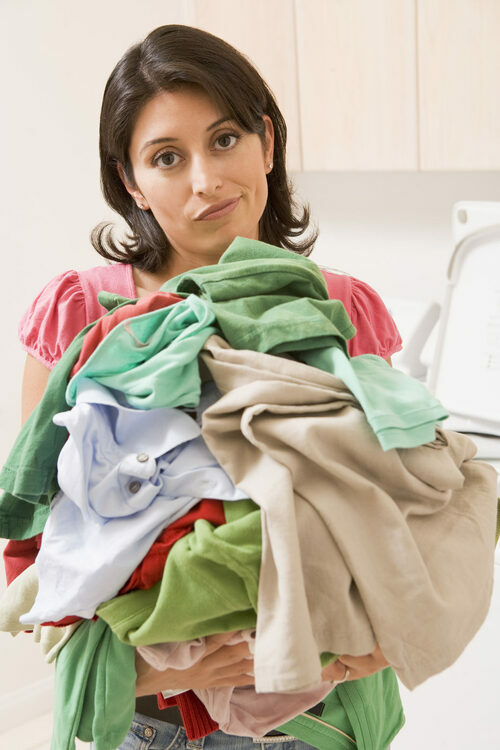 I do not dump clean clothes to get another bucket—I sort and put them away. When I had cloth diapers, there was a separate bucket with a lid (of course). When I grew up, my mom marked our clothes with embroidery thread. (I had five sisters.) We each had a different color. I also do no match socks. I put all their socks in their respective piles. They match them, or not. When I have a spare moment, even if we are almost ready to walk out the door, I can sort a load of laundry. I use my bed. I have separate piles for each boy. I do not put their clothes in their drawers. They do. I do not fold anything special. If they want it hung, they hang it. Their dress or shopping clothes are kept separate. (I do loads on Sunday to keep Sunday dress clothes separate from work clothes. When the boys were young, I put all their clothes in buckets (like the kind for washing dishes) on shelves. All four boys’ clothing were in one cupboard without drawers. The buckets slide in and out of the shelf easily. I had two doors so I could shut them and not see the buckets. Each boy had one bucket for underwear and socks, one for shirts, and one for shorts, with a pair of pants in case. When the seasons changed, all those would go into a box for storage for the next child and I’d bring out the winter’s long sleeve shirts and pants. Of course, having only boys worked great. By the time one grew out of something, it could be passed on to the next one. I’m not sure whether it would be worth it to store the clothes for a boy who was younger than 2-3 years. I don't use fabric softener. (Maybe those of you who live in colder weather need it for static cling in the winter.) I don’t like their powerful smell. Some things are worth the effort, some things aren’t. If it’s worth it to you to have fresh smelling clothes, great. Washing a load more than one time to try to hang it outside, wasn’t worth it for me. It didn’t simplify things for me. The key with laundry is keep up. Sorry, there’s no magic formula that makes the work go away. I re-read these tips and realized that there’s nothing really great about them. I simply must do the next thing, and in the case of laundry, the next load, fold the next towel...If I have mounds of clothes, dirty or clean, it stares me in the face and depresses me. It’s the little things that can hinder me from focusing on what God wants from me. So I diligently take care of the little things … so I can hear His still, small voice.